The Icarus mythology has fascinated Ford for many years, and here are all the pieces thus inspired. The Kowmung Music Festival Players are featured, along with Terra Australis recorded at the Aspen Festival. Barbara Blackman wrote the text for Parabola. "Like Icarus Ascending" features New York-based violinist Rohan Smith. Contents note: Hymn to the sun -- Like Icarus ascending -- Chamber concerto no. 3: in constant flight -- Parabola -- Icarus drowning. Liner notes include programme notes and biographical information on the composer and performers. Score: Chamber concerto no. 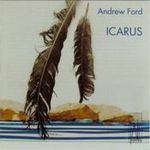 3 : in constant flight / Andrew Ford. Score: Parabola : for two voices, bass clarinet, percussion & piano / music by Andrew Ford ; words by Barbara Blackman. Score: Hymn to the sun : for clarinet, celesta and harp / Andrew Ford ; after Mesomedes of Crete.